Some time ago, people in the Yogyakarta Sleman for crop cyrcle excited with the discovery that the believe is a UFO landing a track record in a rice field. Although for that team research also indicates that the crop cyrcle LAPAN is a handmade human meddling. But recently things like UFOs flying in the area caught the eye of Kunming, China, who later succeeded in the capture through the camera shots. Kunming UFO Research Society expressed similar unidentified object was a UFO hovering like a bird. "It is like a plate," said Zhang Yifang, a UFO researcher in the Straits Times, 31 May 2011. Photo shots of a man from China had gotten while on a trip to the mountain area of ​​Kunming. Initially, the unnamed man had wanted to capture the surrounding natural scenery. However, unexpectedly some unknown object as if dancing in space. "I saw three black dots floating above the dam Songhua. The biggest one looks like a giant butterfly," he said. Songhua River or also known as Sunggari is interesting sights in the East China Sea and is the largest tributary Heilong River (Amur) along the 1434 kilometers. 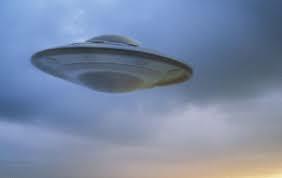 Previously, a similar object into the conversation warm UFO resident of Colorado, United States, at the end of March 2011. A camera recorded the formation of a giant triangle in the night sky Lafayette. This is for the umpteenth time the population of the earth to see strong evidence of humans do not live alone. Page ABCNews reported that strange triangle recorded Leroy van der Vegt and his son, Nick, who was enjoying a night last week. "It's really light and no sound at all," said Leroy.